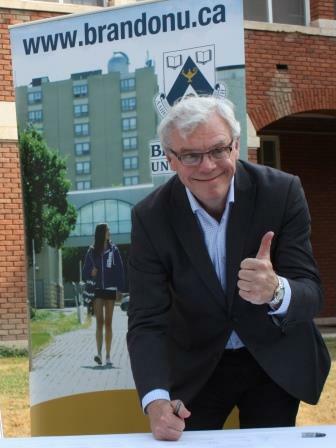 BRANDON, MB – Student success is at the heart of a new collaborative agreement signed today between Brandon University (BU) and Assiniboine Community College (ACC), a partnership to explore new courses, research opportunities and student mobility between the two institutions. 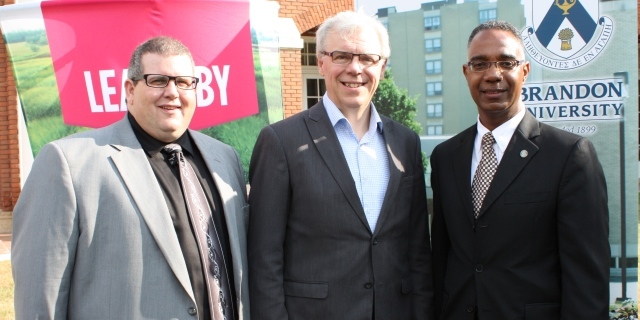 The Memorandum of Understanding (MOU) will enhance both programming and accessibility for more than 9,500 students enrolled each year in post-secondary education in Brandon and the surrounding area. The MOU builds upon a landmark 2009 partnership between BU and ACC, unrivalled in Manitoba post-secondary education. Connect 20/20 led to nine articulation agreements allowing students with credits at one institution to transfer to another in programs including Business Administration, Education, Media Arts, Nursing, Police Studies, and Environmental Science-based courses. Assiniboine Community College has been providing exceptional learning experiences for over 50 years, transforming lives and strengthening Manitoba through applied education and research.